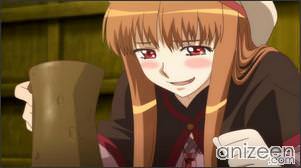 Spice and Wolf’s story revolves around Craft Lawrence, a twenty-five-year-old peddler travelling from town to town selling and buying various things to make a living in a stylized historical setting with European influences. His main goal in life is to gather enough money to start his own shop, and he already has been travelling for seven years while gaining experience in the trade. 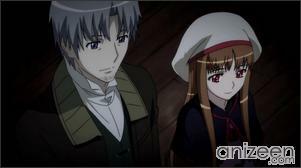 One night when stopped at the town of Pasroe, he finds in his wagon a 250-year-old pagan wolf-deity girl named Horo. She appears to be that of a fifteen-year-old girl, except for a wolf’s tail and ears. Despite having the responsibility to watch over the town, she wants to go back to her homeland in the north called Yoitsu; she believes the people have already forsaken her anyway and that she has kept her promise to maintain the good harvests. 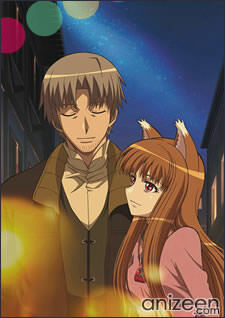 In Spice and Wolf II, continuing where the first series left off, it follows Craft Lawrence and his sharp tongued wolf god companion Horo on their journey to return to Horo’s home to the north called Yoitsu. A tender relationship has blossomed between the characters, as they make deals, travel between cities, encounter religious fanatics or vice versa and mostly just do what a traveling merchant has to do to get by. Craft Lawrence, who chiefly goes by his surname, is a twenty-five-year-old traveling peddler who goes from town to town buying and selling various things in order to make a living. 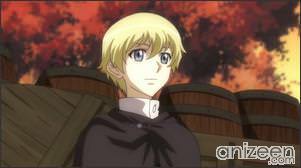 When he was twelve, he became an apprentice to a merchant relative, and set out on his own at eighteen. His goal in life is to gather enough money to start his own shop, and he has already been traveling for seven years while gaining experience in the trade. 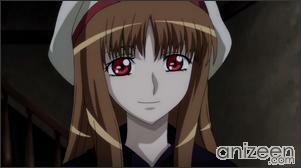 He meets Horo one night and eventually agrees to her traveling with him. She helps him by providing her wisdom which helps to increase his profits and get him out of jams. 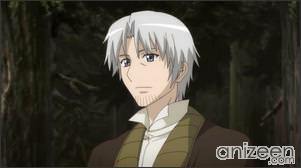 Horo is a wolf god of harvest originally from a land in the north known as Yoitsu. She made a promise with men from a town called Pasroe where she would ensure the town would have good wheat harvests year after year. 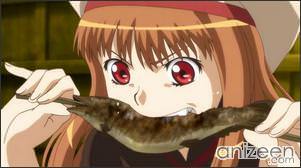 However, as time went on, the townspeople slowly started to forsake Horo and did not rely on her as they once did. 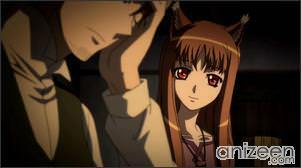 As such, Horo escapes from town in Lawrence’s wagon and started traveling with him to see how much the world has changed since she has been in Pasroe. 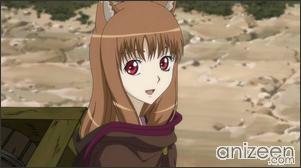 Horo has chosen the form of a fifteen-year-old girl, though she still retains her large white-tipped wolf tail, and ears. Her true form is that of a very large wolf which many people revered and feared. She refers to herself as the “Wise Wolf of Yoitsu”. She is typically very haughty and self-sufficient, though due to her isolation for hundreds of years in Pasroe, she came to feel very lonely, and sometimes shows a more fragile side of her. She has a peculiar way of speaking, modeled after that of the oiran high-class courtesans. She is fond of delicious food and alcohol, though especially loves apples. She takes pride in her tail and takes special care of it, constantly combing and maintaining it. Chloe is an anime-original character. She is a villager of Pasroe and has known Lawrence for a long time. In fact, Lawrence taught her how to be a merchant. Despite still not knowing how she should feel about him, she respects him as her teacher. Nola Arendt makes her first appearance in volume two of the novels. She is a skilled shepherdess from a church-town named Ryubinhaigen. Her companion in this profession is a well-trained sheep dog named Enekk. 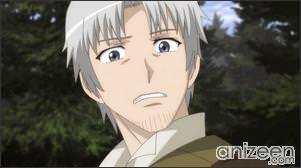 She entrusts Lawrence with a task after they meet. Fermi Amati makes his first appearance in volume three of the novels. He is a young man who works as a fish broker. Ookami to Koushinryou 2 (狼と香辛料 メ第2, aka Spice and Wolf) is a Japanese light novel series written by Isuna Hasekura, with illustrations by Juu Ayakura. The Mainichi Shimbun reported that as of August 2007, over 500,000 copies of the novels have been sold. 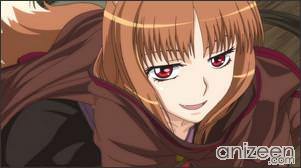 The series has been called a “unique fantasy” by Mainichi Shimbun due to the plot focusing on economics, trade, and peddling rather than the typical staples of fantasy such as swords and magic. A manga adaptation illustrated by Keito Koume began serialization in the Japanese seinen magazine Dengeki Maoh on September 27, 2007, published by MediaWorks. A visual novel based on the series for the Nintendo DS was released on June 26, 2008 by ASCII Media Works, and another visual novel for the DS will be released on September 17, 2009. 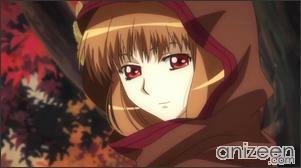 The second season of the anime series titled Spice and Wolf II premiered on July 9, 2009.